Lindstrom Air Conditioning & Plumbing the company that Hollywood, Florida residents can trust when it comes to air conditioning repair, service & installation and plumbing issues. We have been serving Hollywood and Broward County since 1975 and have become one of the oldest and most trusted HVAC and plumbing companies in South Florida. It is our top priority to provide Hollywood and South Florida homeowners with peace of mind, making sure all of their HVAC and plumbing equipment is running as efficiently and effectively as possible. 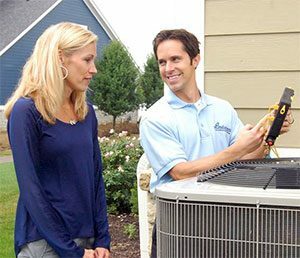 Whether you need a tune-up, new AC system or a quick repair, our AC repair experts are ready to assist. We have serviced, repaired and installed air conditioners and heat pumps of all makes and models in Hollywood and South Florida homes for decades. And no matter what make or model your air conditioning system may be, our AC pros are trained and properly equipped to take care of your AC issue and restore comfort in your Hollywood, FL home. Whatever your HVAC needs may be, Lindstrom is the air conditioning contractor Hollywood, Florida residents can rely on for quality work and fast service! Lindstrom is also the name to remember when you need a plumber in Hollywood, FL. We offer fast, professional plumbing service performed by our skilled plumbers. And when you call us for your plumbing needs you can expect our plumbers to be friendly and show up on-time. From fixing small leaks to water heater installation or sewer line repair, Lindstrom’s plumbers have you covered! We have over 200 employees that are ready to serve you with the best HVAC and plumbing service in South Florida. When it comes to keeping Hollywood, FL homeowners comfortable, we cannot be matched! Give us a call today or schedule service online. “Very professional. He took great care to keep my floors clean and not track dirt in while walking between the outside and inside parts of the A/C.” – Mike H.